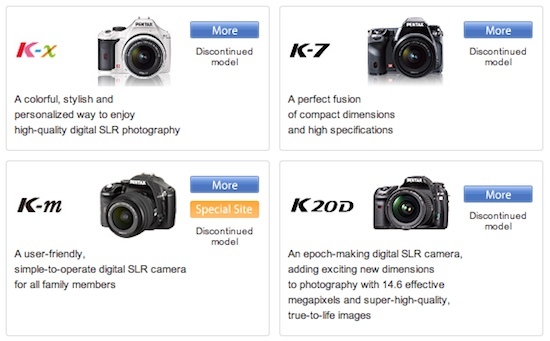 Pentax K-x and K-7 are now listed as discontinued on pentax.jp. Both models were replaced by the Penatx K-r and K-5 in September 2010. The now discontinued K-x and K-7 were announced in September 2009. It will be interesting to see if Pentax will keep this 12 months refresh cycle. This entry was posted in Pentax and tagged To be discontinued.... Bookmark the permalink. Trackbacks are closed, but you can post a comment.